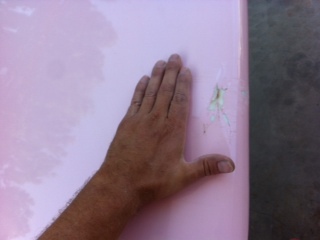 Paddleboard damage in our area is becoming more common with the market introducing poorly made, cheap boards. There are many hazards that we need to be aware including rocks, docks, cleats, nail heads, in-water latters. If you have damaged your Paddleboard, remove it immediately from the water. 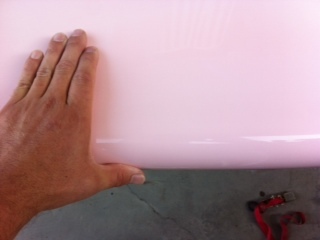 Cheaper Paddleboards have Styrofoam core and they will absorb water trapping moisture in the board. Quality Paddleboards will be solid construction with advanced materials that will protect the board from water damage but should also be removed from the water immediately for inspection and repair. Some dings are simple enough for a novice to repair and we sell a number of repair kits that cost around $20-$30. We can give you a little guidance on getting the job completed. Other type of repairs (Cleat damage, Dock Nail damage, rocks, etc.) require more time and expertise to ensure a proper repair. That's where we can help. We do a majority of board repairs on-site and finish most repairs in a week. More extensive repairs may be sent out to an off-site shop and could require more time. Railtape - Installation - We offer Railtape installation. We offer 2" or 3" Railtape, railtape installation is $25.00. 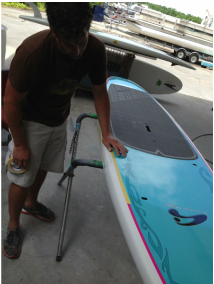 Railtape and/or Paddle saver tape will greatly reduce the wear to side rails of your paddleboard. We highly recommend this product/service to protect and maintain your investment for years to come. Drop with your board by and we'll give you a quote. The price of the repair depends on the level of restoration We can receive the board at any of our locations, but major repairs are completed in our Cornelius Location. because it's polymer is more slippery than water! IT REALLY WORKS. Use for better response, reduced paddle fatigue, access to bigger waves and more radical tricks. XC resists salt and dirt and puts on a beautiful protective shine to keep your investment looking like new.